A Daily Dose of Fit: Give overnight oats a try. Give overnight oats a try. As you all know, I am a huge fan of oatmeal. (Especially if it involves zucchini!) It gives good carb, and keeps me full for quite some time. 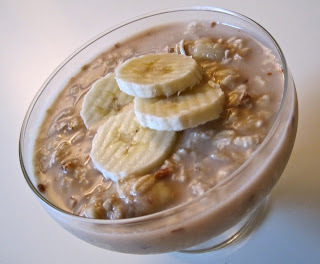 But at this time of year, I have a love-hate relationship with eating oatmeal because it's so darn hot outside. And who wants a bowl of hot, steaming oatmeal when the day itself is both hot and steaming? Usually not me, but I force it down anyway because it tastes so good. Enter overnight oats—I check a number of food blogs on a daily basis and quite a few of them rave about the exceptional nature of this breakfast alternative. They're healthy, can be vegan or lactose tolerant if that's your thing, and refreshingly delicious compared to stove top (or microwave) oats. See photo at right. Banana Pecan Overnight Oats in all their glory. I know, it kinda looks like soggy cereal. The flavor is anything but, I promise. And they're oh-so-very simple to make. The night before you intend to indulge, mix all ingredients in a bowl. Cover, and place in the 'fridge until the morning. Mix, top with banana slices. Enjoy! I know. So hard. The beautiful thing about overnight oats is that, like regular oatmeal, they're so versatile! I plan on incorporating almond butter, blueberries and cinnamon in the near future. And I've always wanted to try different oats. Be sure to let me know if you come up with an especially delicious concoction. I'll give it a whirl, for sure. I LOVE LOVE LOVE LOVE LOVE LOVE LOVE LOVE LOVE LOVE LOVE LOVE LOVE LOVE LOVE LOVE LOVE LOVE LOVE OATMEAL!!!! It had become my breakfast of choice here in Peace Corps....supreme with nuts, flaxseed, honey, milk and sometimes coconut! BUT, my friend, I have NEVER heard of overnight oats! CANNOT WAIT TO MAKE THESE! I bet they are fantastic! Breakfast mañana!!! Impromptu fitness is the best. Low back pain isn't fun. I'm feeling a bit disgruntled. It's Healthy Week at NBC Universal! Chocolate and mint in water, oh my! Make sure fat is your friend, not your foe. Turn everyday activities into exercises. Try this hot treadmill routine! Are you making these common training mistakes? "I look fat," she said.